To mix up the monotony of scrambled eggs (over-easy, oh how I miss thee), we seasoned the pan by first adding leftover seasoned ground turkey from Thursday night’s taco salad. Scramble eggs as usual, and top with your choice of taco-friendly ingredients. In my case, that was avocado, tomatoes and goat milk yogurt. Part two of this week’s pre-made meal makeover was pulled pork in the crockpot, served twice (and counting!) with quinoa and veggies. It started with my recipe for taco-ready crock pot pulled pork, which basically consists of a pork tenderloin, a large can of diced tomatoes, frozen corn and taco seasoning in the crock pot. And there is still plenty of leftover pork! It bothers me when I pile a bunch of delicious toppings into a taco shell while propping it straight up, and as soon as I let go, all the toppings fall out. This crock pot recipe solves that problem. In a crock pot, mix 1 large can of crushed or diced tomatoes with 4 tbsp taco seasoning and 1 bag of frozen corn. Add pork tenderloin and stir to cover loins with sauce. Cook on low for 6 hours. Pull meat apart with two forks and stir until blended. Since corn and tomatoes are already included, you technically don’t need to add toppings. But, we had ours with fuss-free shredded cheese and green onions. The results were so delicious, I kept sneaking bites before dinner, David had spoonfuls on a plate for seconds, and Indy wouldn’t stay out of the kitchen all night. This morning I embraced resolutions to eat healthy, make more meals at home, and embrace imperfection. Inspired by a baked eggs recipe from Saveur, I made some tweaks; adding mushrooms and onions, swapping cream for almond milk, and leaving out the bacon. Despite some timing adjustments with the eggs, the result was a delicious brunch that’s deceptively healthy. First, saute sliced mushrooms and chopped onions with olive oil. Season with salt and pepper. Add spinach at the end and remove from heat. Grease two oven-safe bowls or small gratin dishes with butter. Next, divide mushroom mixture between two bowls. Make 2 wells in each bowl, and carefully crack 1 egg into each well. Add 4 tomato wedges and 2 spoonfuls of almond milk to each bowl. Sprinkle with parmesan, nutmeg, salt and pepper. Bake uncovered at 425 degrees or higher if your stoneware can handle it. Remove once the egg whites are opaque, and topping is golden brown. Note: It took me much longer than the 5 minutes (under a broiler) that the recipe suggested, to cook the eggs through. In fact, I discovered there was still clear liquid on the bottom layer, so I put them back in until I felt safer about the finished result. In total, I probably cooked them for 20 minutes or so, but it will ultimately depend on your risk tolerance, oven and cookware. Delicious when served and scooped with sourdough toast! Lasagna noodles saved dinner, once again. Hidden in the bowels in the cupboard, they’ve come to the rescue many times before, paired with unexpected partners like beans, goat cheese and butternut squash. In a large pan, sauté 1 chopped onion in 4 tbsp butter. Add fresh spinach by handfuls, and simmer on low. In a separate nonstick pan, brown ground turkey. Add 1/4 tsp each of cinnamon and pepper; and 2 cans crushed/diced tomatoes. Reduce heat and bring to simmer. Add 1 cup almond milk and 1 tsp salt. Combine turkey with spinach, simmer on low. In a sauce pan over medium heat, whisk together 4 tbsp olive oil and 4 tbsp white flour. Stir constantly until the mixture starts to bubble and turn a light golden color. Turn off heat. Mix in 2 cups cold almond milk and 1 cup of yogurt. Stir constantly and turn a medium-high heat until the mixture starts to boil. Add 1/3 cup of grated Gruyere cheese and 1/3 cup of Parmesan. Add 1/2 teaspoon of salt, and a sprinkling of nutmeg and black pepper. Mix together until melted and remove from heat. Bake covered with foil at 375 degrees for 30 minutes. Enjoy the smell of cinnamon throughout the house, and every time you heat up the leftovers! I’m obsessed with tomatoes year-round, but now is the time to savor them as the star of the show. 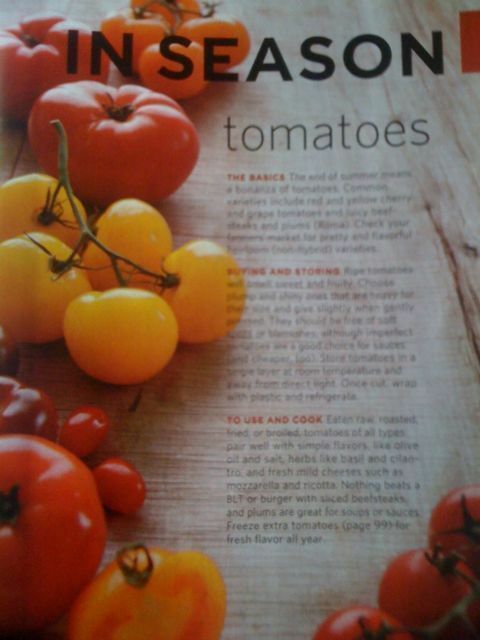 How do you use tomatoes as a main ingredient? When looks don’t matter, I make “one-pot” salad with Tupperware or the generic Ikea plastic container set I picked up for $5 back in September. All-in-one, I combine lettuce (straight after washing is okay – use the lid to drain excess water) and desired ingredients with dressing, place lid on tightly and shake it… like a Polaroid picture! Divide among plates or bowls, and serve.